When people talk about the aura, do they really know what it means? There are numerous books on the market with extremely long-winded explanations for the colours, some of which are right, and some of which are only half-right, but all miss out one important ingredient, the soul essences. The aura is a combination of soul essences and individual character essences, consisting of physical and emotional problems combined. The soul essences are combined of love, sensitivity, compassion and understanding, and together with whatever is going on in your life, they all make up the varying degrees of colours that make up your aura. The bulk of the aura surrounds the head and shoulders, extending outwards normally 12 to 14 inches. The rest of the body has around 6 inches of aura protruding out from it. It is not static however, but permeats in and out, waxing and waning depending on how you are feeling on any given day. Also, the aura never stays the same throughout life, because as we grow and mature in character, so the aura changes to reflect this. The more we solve our problems and become happier within ourselves, so the colours will become lighter and more spiritual. It is not only possible to see the aura, but to feel it as well. We all do this without even realising it. How often has a person walked into a room and you have felt uncomfortable? You don’t know why, you just do. This person will more than likely have a negative outlook on life and you sense that through their aura. Your ‘living space’ is approximately 3 ft in width surrounding your body, but you can pick up the ‘vibes’ from another person if you are sensitive enough. If someone gets too close physically, there is a natural reaction to step back, to get a more comfortable distance between you, unless you are comfortable with that person of course! Emotions can have a tremendous effect on the aura as can physical ailments. It is possible to see in someone where there is pain. There will be a protrusion in one or more areas which indicates there is a problem, or there has been in the past and a residue of it is left. The colour(s) attached to the protrusion can also help to understand the problem. Stress is a big factor in all our lives, especially in the cities. Here, our ‘living space’ is being continually invaded. We travel on buses and trains, work in small offices, walk down crowded streets every day, and although we get used to it, deep within us stress slowly builds. Through a period of time, this stress can cause further emotional and physical problems for us. In the countryside where space is abundant, pollution and noise are less so there is less stress. There is more positive energy in the countryside and the pace of life tends to be slower, therefore people tend to be healthier and happier. So what do you do if you have no choice but to live in a city? If you have a garden, then this can be a great substitute for the countryside. Plants have an aura too and give off positive energy which can help with stress and any form of communing with nature is a stress-reliever. Animals also have an aura and having a pet can be calming, but our society today never seems to have enough time for calming the mind and soul. 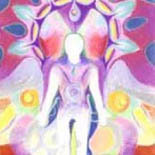 This is all reflected in the state of our health and can be seen in the aura. So being able to sense or see the aura can be a useful tool in our lives, as well as opening our mind to help us become more aware of ourselves and our surroundings, thus helping us become happier within ourselves. How Do We See The Aura Colours? In each eye there are 137 million receptors. These are divided up into 7 million cones, and 130 million rods. The cones are for focused day vision and is the origin of seeing colour. Rods are used to help us see in the dark and are the receptors of our peripheral vision. In low light conditions the rods are coated with a substance called rhodopsin which is extremely light sensitive. It bleaches out quickly as light hits the receptor. As the eye adjusts to the low light, the rhodopsin resynthesize itself, enabling us to see "in the dark". It is by using the peripheral vision in low light conditions that we are able to see the aura. Method 1: After a short meditation, half-close your eyes in a dimmed room and allow your mind to un-focus itself so you are in an "in-between" state. Like in a daydream almost. Shapes and/or colours will start to appear. These may be limited at first, and only seen as a grey/blue mist close to the body. With practice, you will soon see more colours and eventually feel substance to them. Method 2: Again after becoming relaxed, concentrate on the picture or person that you are trying to "see", then close your eyes and allow the colours to come into your mind's eye. 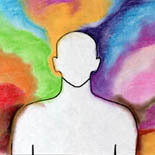 You may actually see the aura in your mind, or you may have a sense of what and where the colours are. It is important to have your mind and body relaxed. Method 3: This is a much more "hands on" method of reading the aura and requires that the person is actually there in person to work properly. Again after calming the mind and body, or meditating, you should have the person sit in a chair or standing in front of you. 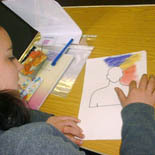 You then concentrate on one colour at a time and place your hands about 3 or 4 inches from the body. As you slowly run your hands over the head and down to the shoulders, you will either sense a strong pull, or your hands or third eye will tingle or become hot or cold. This is your sign that you have found that particular colour in that area of the person's aura. You need to do this for each colour until you have a complete aura drawing. The next step is to interpret the colours that have been drawn. This is done by looking at each individual colour and attaching a meaning to it. A good start is to look at each colour and see what you feel about it. Imagine yourself wrapped in a blanket of that one colour. How do you feel? Write it down so you can add to it as you progress. Each person looks at colour differently, and our perception is based on our experiences. Therefore, two people can look at the same colour and feel differently about it. However, there are basic interpretations of colours that people tend to agree on. These are listed in the colour chart. After the drawing has been done and the meanings of the colours decided upon, the next step is to marry the two. This can take a lot of practice, and the more sensitive and open you are, the easier it will be. For example, if red is next to black, or has some black in it, then the red has more of the negative aspects than the positive. Similarly, if red is next to white, then it most definitely positive and can be helpful to move that person forward in their life.